John Sitter, the Mary Lee Duda Professor of Literature in Notre Dame’s English Department, was presented with the 2014 Sheedy Excellence in Teaching Award on Tuesday, December 2, 2014. The Sheedy award is the highest teaching honor in the College. It was founded in 1970 in honor of Rev. Charles E. Sheedy, C.S.C., who served as dean of Arts and Letters from 1951–69. A renowned scholar of 18th-century poetry, Sitter does not “allow his own field to limit his intellectual interests,” said Valerie Sayers, professor and former chair of the Department of English. “For several decades, John has also taught poetry, fiction, the essay, creative nonfiction, and television—from ancient times to the present,” she said. “We are particularly excited by his recent work in the fields of eco-criticism and sustainability studies. Sitter has written and edited numerous works on 18th-century literature, including The Cambridge Introduction to Eighteenth-Century Poetry, which was named an Outstanding Academic Title of 2011 by Choice magazine. His book Literary Loneliness in Eighteenth-Century England was awarded the Gottschalk Prize by the American Society for Eighteenth-Century Studies. He is also editor of The Cambridge Companion to Eighteenth-Century Poetry and two volumes of The Dictionary of Literary Biography. Most recently, he has published articles on Samuel Johnson, climate change, and academic responsibility. Sitter brings his research into the classroom through courses such as British Literary Traditions, where he “teaches with a contagious zeal that makes students excited to dive into the material,” said a sophomore English major who recommended Sitter for the Sheedy Award. “He also pushed me to improve my writing, not settling for anything less than my best work,” the student wrote. In turn, Sitter said that his students’ curiosity and ever-changing perspectives enliven his classroom discussions and enrich his research. “I think literary interpretation is always a transaction between past and present—trying to be faithful to what has been there from the beginning, but understanding that the meaning is always changing because the readers are always changing. The literature teacher is someone trying to facilitate that movement back and forth between the past and present. Sitter also has a passion for teaching satire, which he said “comes naturally to someone who works in the 18th century,” a period filled with notable satirists. One of his longtime favorite courses is titled Satire: Jonathan Swift to Jon Stewart and focuses on great moments in English and American satire through the centuries. In 2011, Sitter became involved in the development of a new interdisciplinary minor in sustainability studies, housed in the College of Science and open to students across the University. His decision to focus on sustainability, Sitter said, was born of a personal interest in the environment as well as courses he had taught on literature and nature. “So much literature is dependent on natural imagery and the changing depictions of nature are very interesting—whether it seems chaotic or orderly, dangerous or nurturing,” he said. Sitter, who is also a fellow in the John J. Reilly Center for Science, Technology, and Values, is on the advisory committee for the minor and has helped team teach the introductory course several times—with colleagues in science, sociology, theology, and engineering. “It has been a steep learning curve and a really exciting one,” he said. “I think the gateway course is a good model for students because they see professors from very different fields grappling with common issues and working outside our comfort zones. None of us was trained in sustainability. Sitter has become a campus leader in sustainability instruction, said Jessica Hellmann, associate professor in the Department of Biological Sciences. 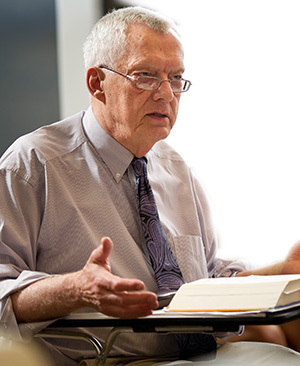 “John’s contributions are widely known among students, faculty colleagues, and administrators. Without John’s leadership, this new dimension of the undergraduate curriculum would not have been possible. In addition to the enthusiastic support of the Department of English, Sitter received letters of support for his Sheedy Award nomination from colleagues and students in biology, sociology, chemistry, marketing, and anthropology. Winning the Sheedy Award, Sitter said, came as a gratifying surprise. Sitter credits his own high school English teacher, Br. Gerard Molyneaux F.S.C., with inspiring his career path. Molyneaux, now a professor of communication at La Salle University, was delighted to learn of Sitter’s latest accomplishment. “Over 50 years ago, John graduated from La Salle High, a school for 200 boys in the mountains of western Maryland,” Molyneaux said. “The size of the school bred a Renaissance-man spirit among the students, and for his peers, John was the point man of the movement: the class president who played football and basketball, edited the school paper, and performed on stage. Even at that age, a lover of literature and of wit, John had his sights set of scholarship. When Sitter looks at the course of his career and his range of diverse interests, one surprising connection emerges—the idea of posterity. The current environmental crisis is severe, Sitter said, and is something we must all face together, no matter what discipline we study. “It is important to think about how our different areas of knowledge complement each other and to understand that many of our most serious problems are not well behaved and do not stay within our disciplinary lines. They take all of our resources to address. Sitter has high expectations for Notre Dame students and believes that the critical thinking and communication skills they hone through Arts and Letters courses will serve them well in considering environmental threats. Originally published by Carrie Gates at al.nd.edu on December 01, 2014.